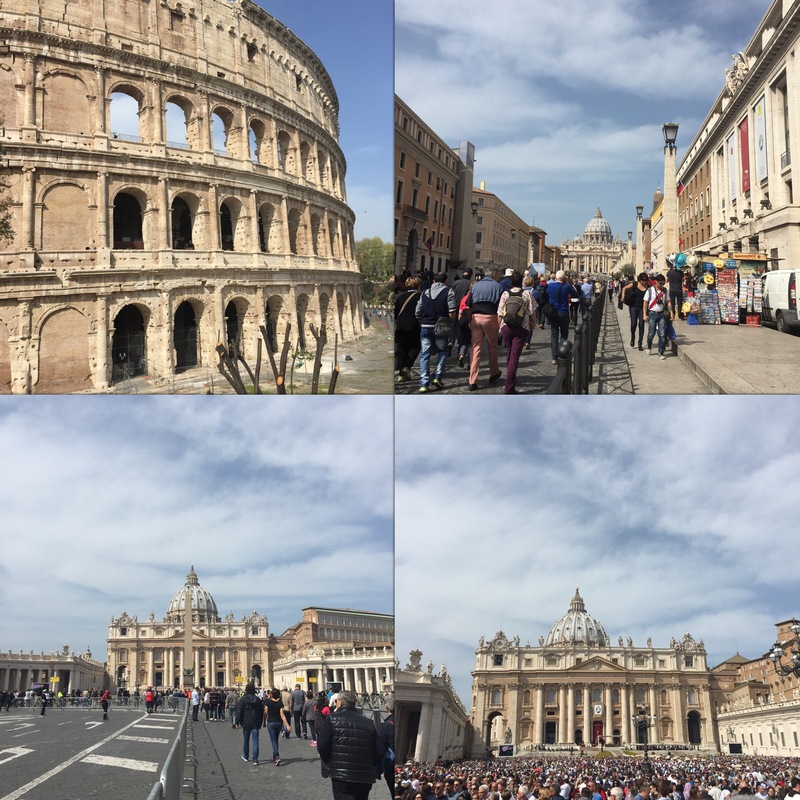 Our day began with a free walking tour around a few areas of Rome which your wouldn’t generally find yourself unless you knew they were there. The tour was just under 3 hours long so we covered quite a bit of ground and saw lots of places. At the halfway point we stopped and got gelato, ofcourse I got chocolate and was lucky enough to get it on two comes because the lady broke the first one. From here we headed down to the Pantheon and went inside their to see the massive hole in the ceiling. 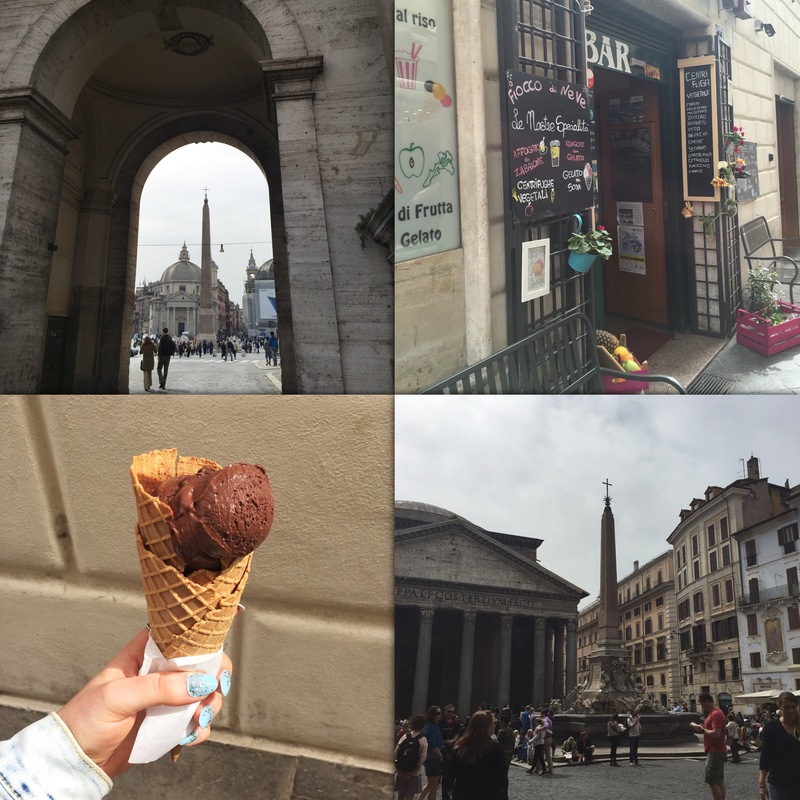 It was act sully such a was day with temperatures around 25degrees so it was really nice going in marble buildings and in the small streets out of direct sunlight. Ofcourse I can’t actually tell you exactly what we saw because I wasn’t exactly paying attention, I was just there to take photos. The tour finished up just outside the Varican as you can see in the middle photo behind the bridge. After the tour we walked all the back to the main area, which felt like it took forever as my legs were aching so much at this point. Having an iPhone and being able to use it abroad is such a handy thing, we literally would not be able to find our way around if we didn’t have it. We took some back streets and eventually found Hard Rock Cafe where we decided to go for lunch, and I also have a cheeky cocktail. My favorit me is the Big-Kabluna, if you like Malibu and Pina Colado then you must try it, plus it’s blue! 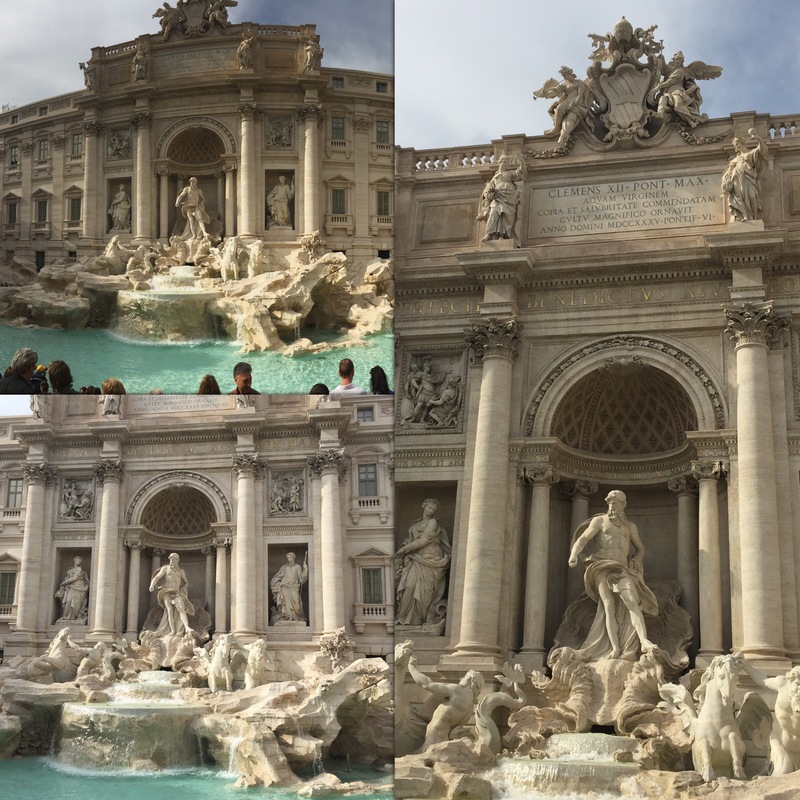 After lunch we headed to the Trevi Fountain. 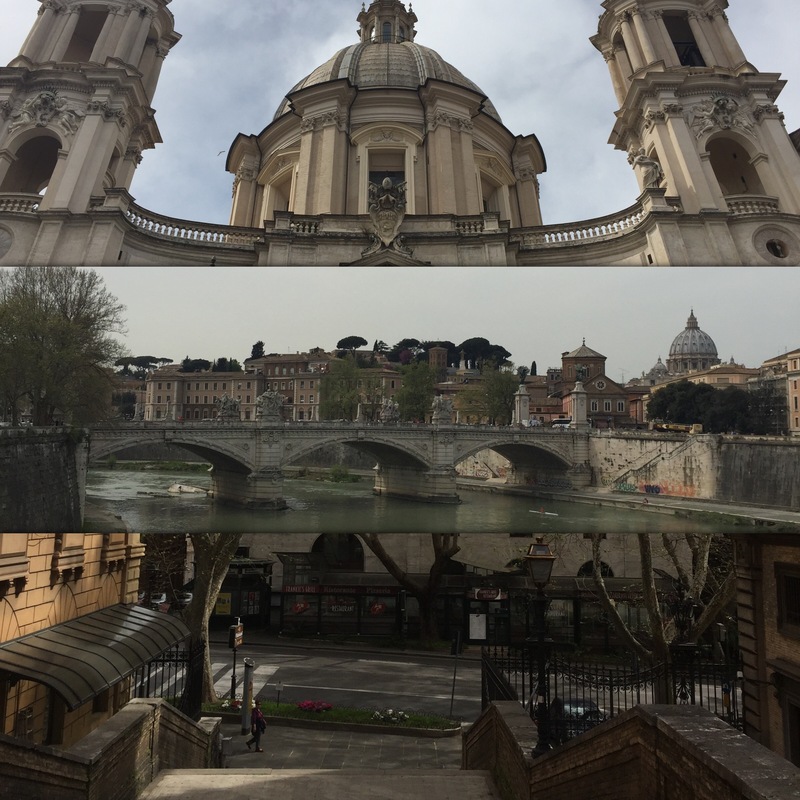 This was my second time in Rome so I had seen most of what we were seeing again, but it’s still amazing. It was so busy here, and it’s so hard to get a photo with no body else in it. After the Trevi Fountain we walked to the Palazzo Venezia which is a palace. Here we paid €7 to go up in a lift to the top, which is the highest point in Rome to see across the city. From here you can see the Colleseum and all the ruins. Our final call of the day was the Spanish Steps, but they were under construction and all boarded off so they weren’t as nice as why they were last time I came. While my mum walked to the top of the steps I went into Sephora and did a little bit of shopping, when in Rome! For dinner we found an amazing McDonald’s just round the corner of the Spanish Steps, it was set right back into the building and was the biggest McDonalds I’ve ever seen. We then caught a taxi back to the hotel and I had a relaxing hot bath for my tired legs. Our second day began by hopping on the sightseeing bus which stops off near the major attractions. 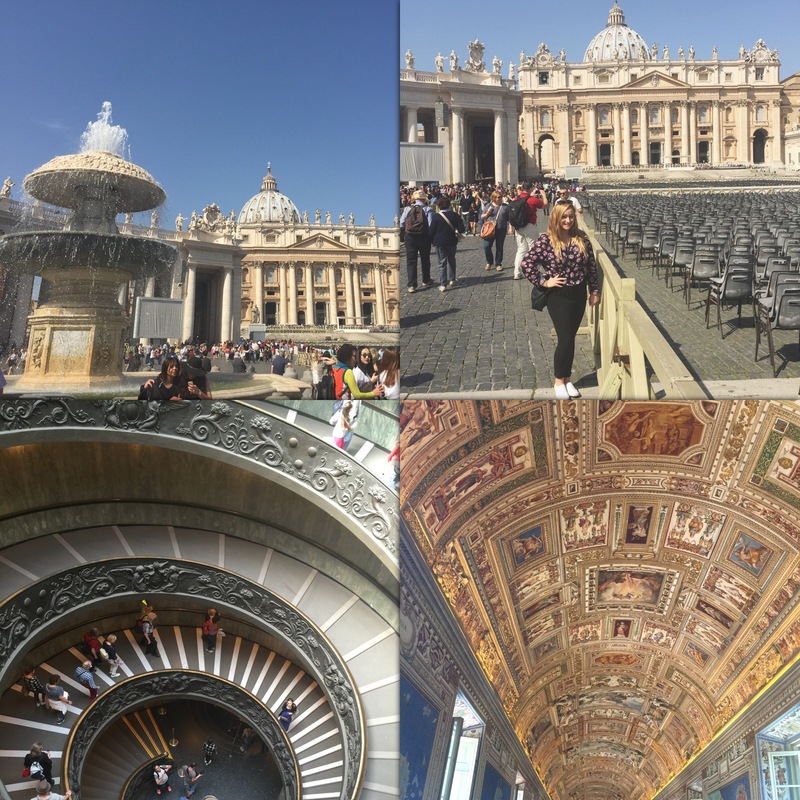 Our first stop was the Vatican as we wanted to go inside, but when we got there we realised there was a special mass on (which we think the Pope was delivering) and there was so much security going into St Peters Square. This day was super hot, 25degrees which is pretty much like being on a summer holiday, but as we were planning on going inside I was wearing tights under my playsuit which was horrible! 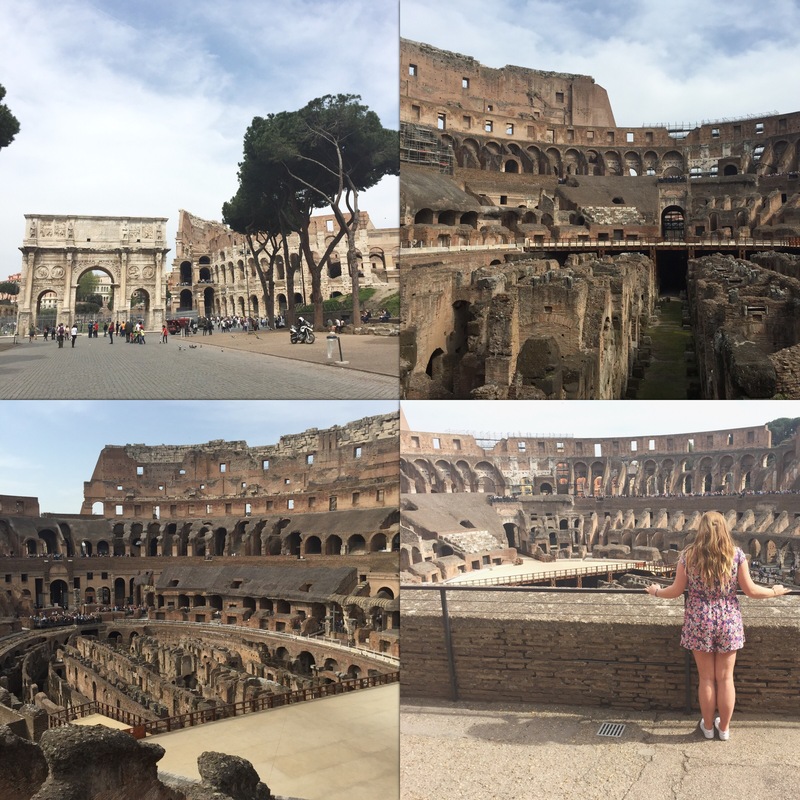 We sat down for a little bit and had gelato and then decided to go to the Colosseum so we didn’t waste a day. 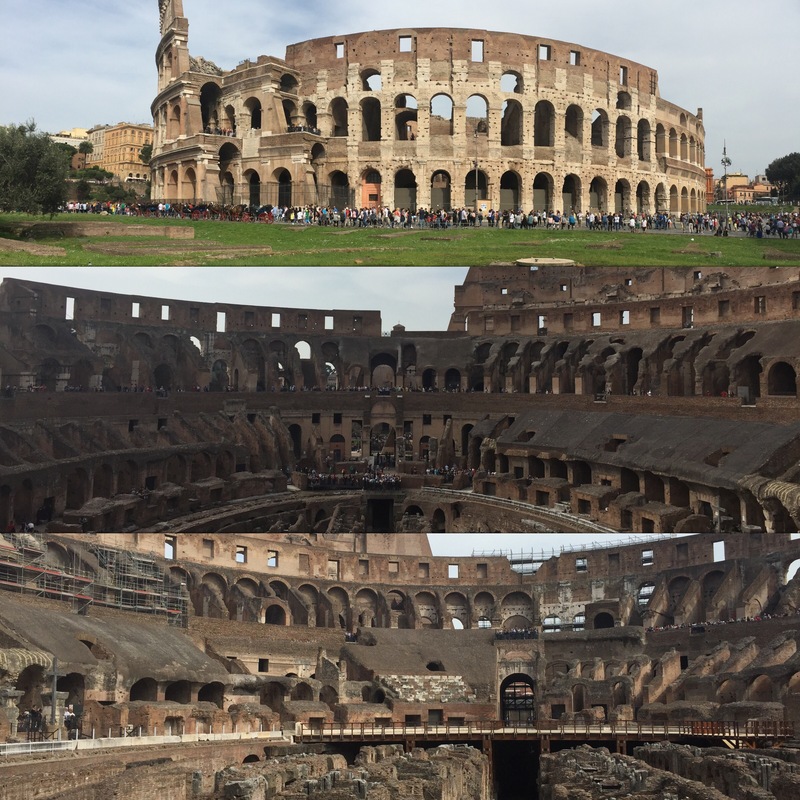 We got back on the bus and got off at the Colleseum, there was a huge queue to get in. As we also didn’t realise the first Sunday of every month all the museums and places are free. We somehow managed to find a tour guide who charges €15 euros for a guided tour and you get to skip the line. So that was worth it just to queue, unfortunately we needed to go to the toilet so we ended up loosing the tour guide so we just walked around on our own which I think is better as moving in huge groups in crowded places is so hard. 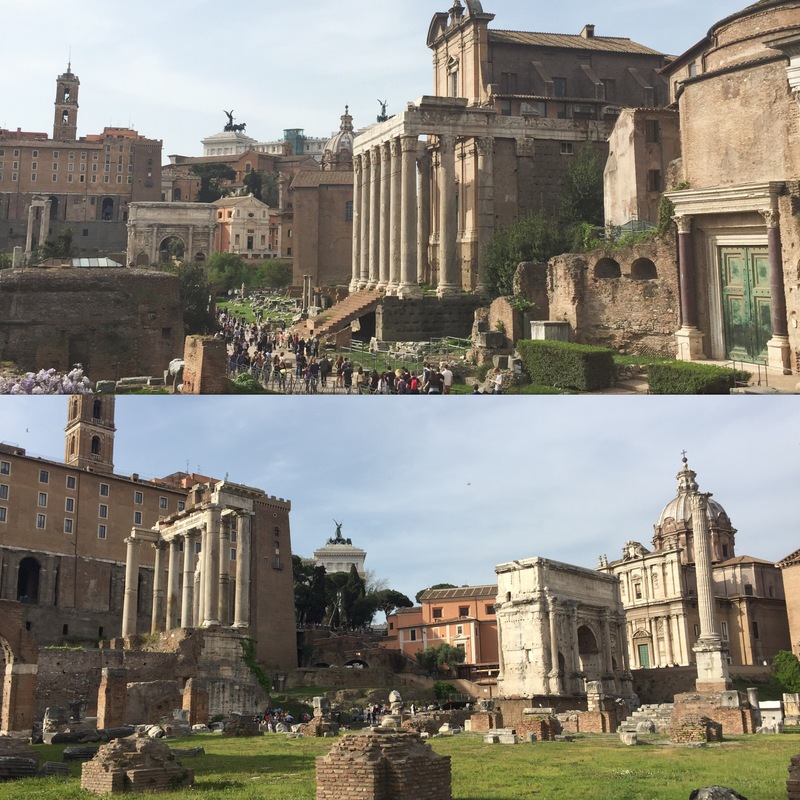 After looking round the Colleseum we went to Palatine hill which is over the road, this was also free so it meant it was really busy. 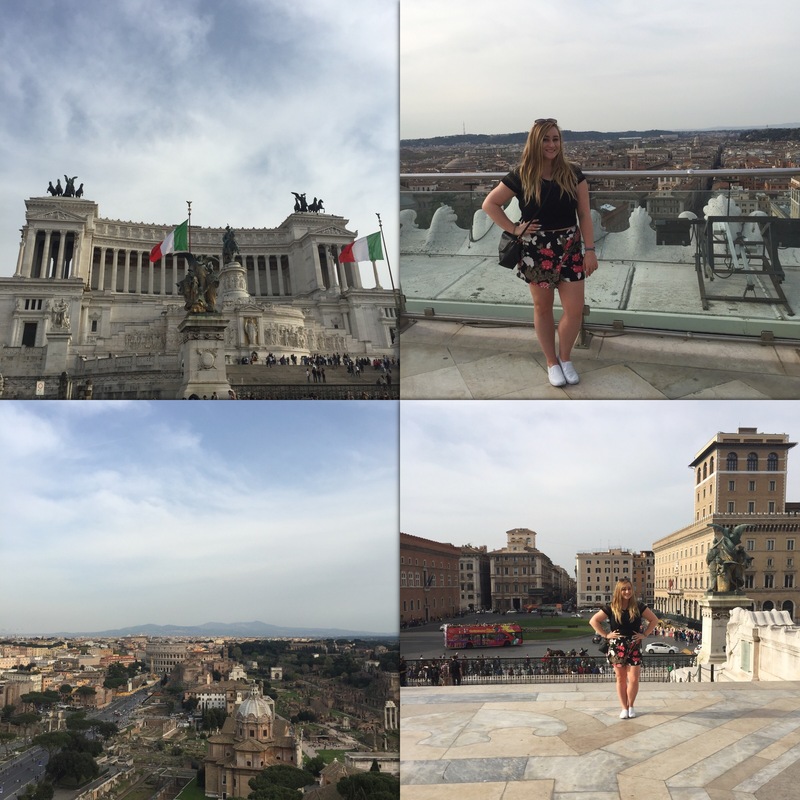 It had loads of Roman ruins and temples which are really cool! There is also loads of drinking water running through the city coming out of fountains which never stop running which means it’s safe to drink. I filled up my bottle so many times as it was such a hot day in the sun! This was the day we finally made it into the Vatican and the Sistine Chapel. When we arrived the queues were massive already, so we headed over to a tourist info place and bought some tickets. 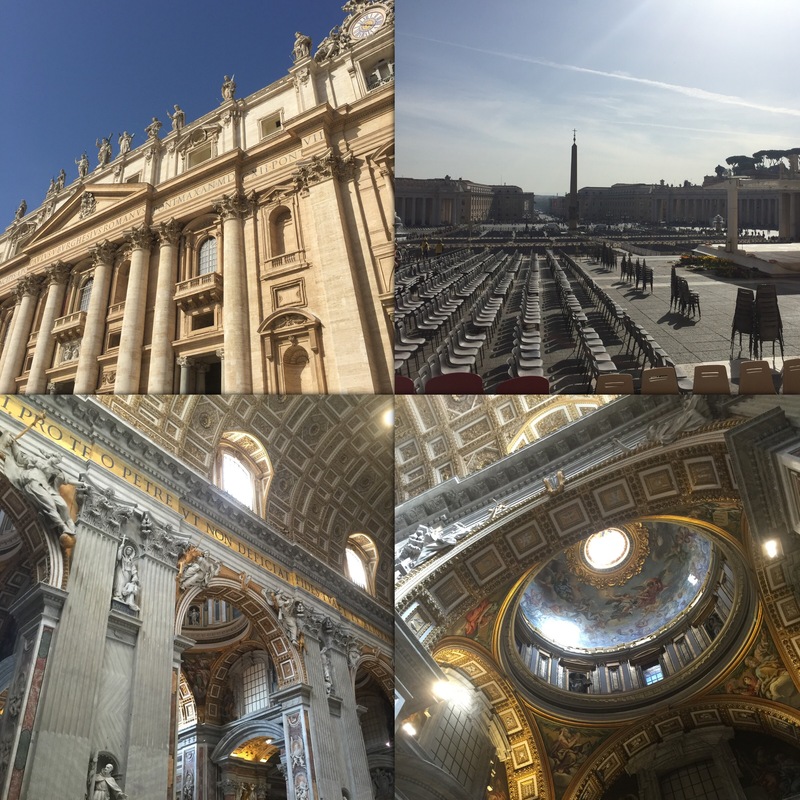 Even though St Peters Basillica is free entry we paid €15 to skip the line as we were on a time limit this day due to flying home. 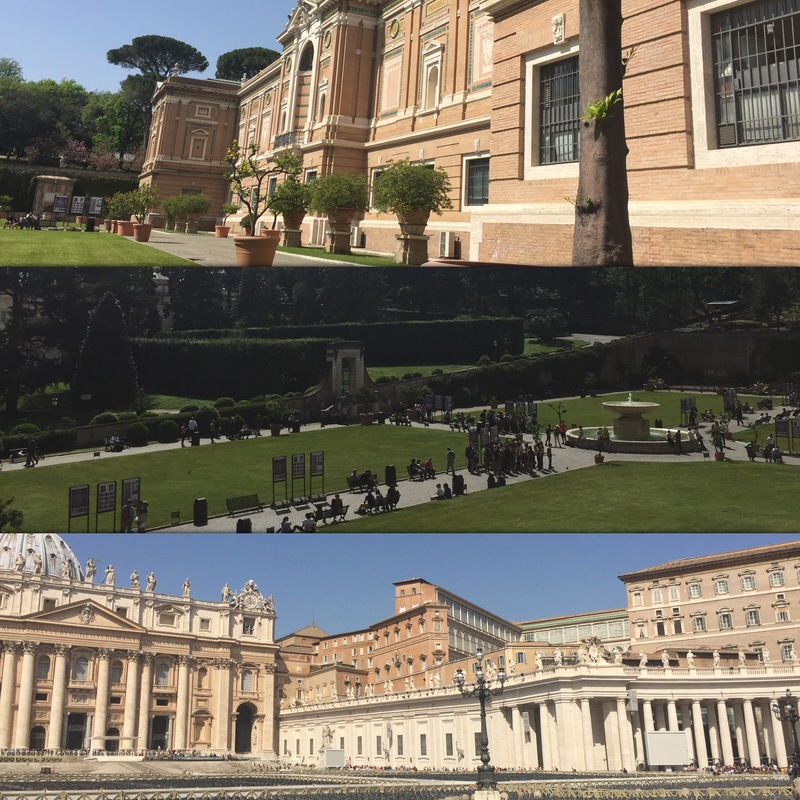 We then also paid €32 for a skip the line pass and entry into the Vatican Museums which was good as we walked straight pass the line and headed into the museums. There is so much to see here so you definelty need a day to take it all in. Once again it was such a hot day, but I opted for leggings this day as I figured I would be a lot cooler with them on rather than tights. Once we had been in the Sistene Chapel I changed into my shorts to cool off. We were actually done earlier that we thought, mainly because our feet hurt so much so we couldn’t bare to walk anymore. We sat out in the square where we had sat the day before and had some more gelato. We got a taxi back to the hotel and found a little place to sit with sun loungers, even though there was a tree in the way of the sun. We then headed to the airport in a taxi which felt like it took forever as it was rush hour traffic when we left. Over all it was a really nice trip, and it was great to see everything again and take more photos.